Brian Kane of Seer Green, Buckinghamshire talks about his dream home and how Beeks ensured that his aspiration to design and build the perfect physical and situational environment for his family was realised. With The Manor House we were looking to realise a dream. It was not our first design and build project, but it was to be the first that would truly be a home. In 2001 Beeks Construction built our first design and build property. Whist we were delighted with the build quality of the house, once living in the property we felt it was more the architect’s home than ours. With the virtue of hindsight there were features we would have changed at the point of build, had I been more frequently on site. There were also practical design elements that would have led to the finished property being better appointed, had I had the opportunity to “live” in the house as it was being constructed. 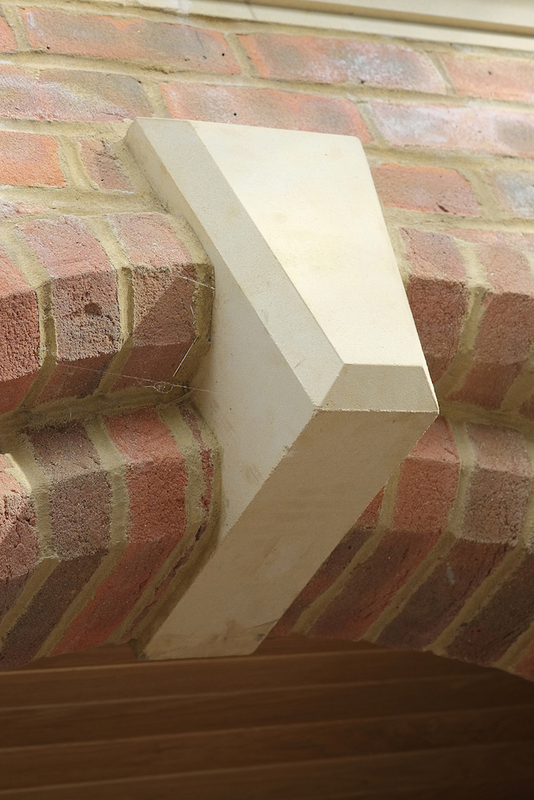 Therefore, with the Seer Green build, I was determined to be involved at every stage of the process. 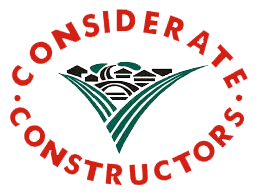 Beeks Construction was the natural build partner for us. They had built the Beaconsfield house to perfection so why would we not return for yet another new home? My design brief for The Manor House was very specific and the architect commissioned to draw up the plans was commissioned on a drawings, planning permission and building regulations basis only. We knew the rooms we wanted, and the exact layout and flow of the house. The kitchen, dining room and orangery were to be the hub of the house with the other rooms flowing seamlessly from this. 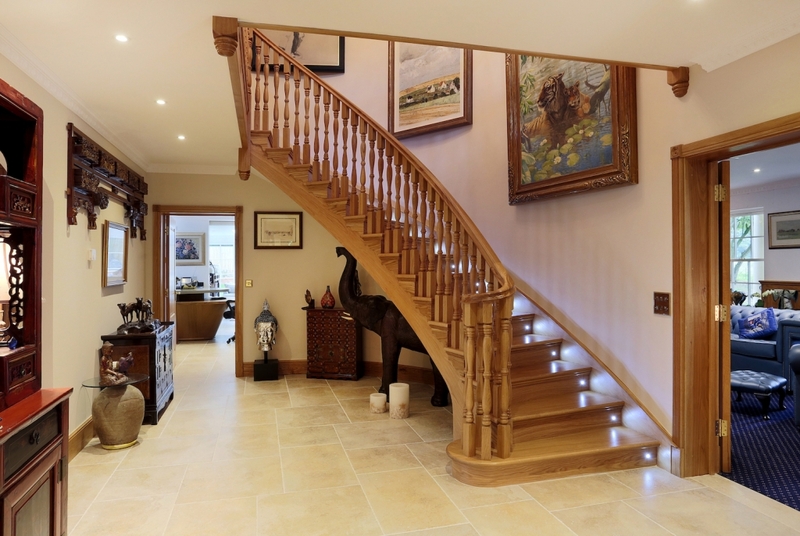 The entrance hallway would ‘welcome’ and then lend its way to the first and second floors. 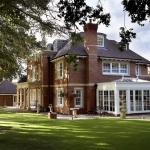 Throughout the build and subsequent maintenance to the Beaconsfield house, we built a good relationship with Beeks and Paul was more than happy for me to be highly involved in the project management and decision making process of The Manor House build. I was on site regularly and visited up to three days a week. This worked well for both parties. 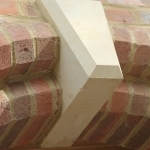 With me on site so regularly, decisions could be made quickly and I had the assurance that the build was progressing in line with the aspirations of our dream home. Where tweaks were required these could be discussed and the provisions for change put in place. It was this involvement that gave me the confidence at every stage that our ambition was about to be realised. One of the many attractions of designing and building our own homes has always been the opportunities that it presents. Over the years we have lived abroad and travelled extensively. We have gathered art, objects and furniture and we are keen for these collections to be a part of our home. By working with Beeks closely to design the space for them we can be sure they are enjoyed rather than stored away. Beeks, whilst always willing to listen, consistently offered best advice. There was never a “no”, but always end scenarios presented to demonstrate the consequence of a decision. Not all the tweaks were minor though. One even required a considerable section of the ground floor to be lowered by at least three inches! It was also essential for Beeks to work at the design stage with the architect to ensure the best position for the house on the plot. This had to factor also the positioning of a standalone triple garage, designed to be large enough to accommodate a range of cars that we now drive. The positioning was not straightforward. Our plot is set in an established garden. A high boundary hedge offers privacy from the rest of the road. Many of the trees on the plot are over 80 years old, most with protection orders. To the boundary the gardens fall seamlessly into the fields behind. Our major priority was to ensure that The Manor House blended into this natural environment; that it did not disturb the natural situation of the property, or affect our new neighbours by making changes that would impact the environment they were used to. 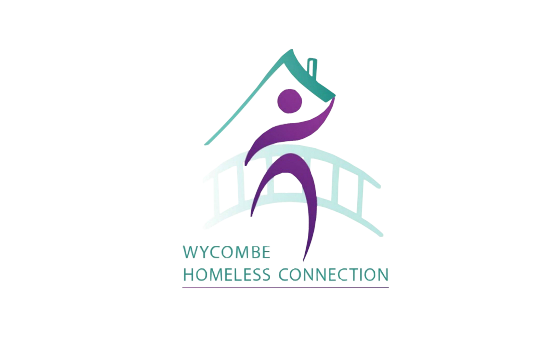 We were, after all, moving into their community and we wanted to be a part of this and not alienate ourselves through avoidable poor planning. However, the natural access point for the driveway would have been right through the hedge! As always, Beeks applied practicality to the problem and with empathy and a seamless juxtaposition integrated the driveway into the template of the grounds. The team created a low maintenance paved and lawned formal garden, which made way to an area of wild flowers and grasses pressing up to the boundary and fields beyond. Situation planning was not the only consideration we had to work through. The second was more of a luxury and lifestyle. Planning requirements stipulated that the house would have to be in keeping with the surrounding properties. Many of these are smaller residential homes and therefore there were some compromises to be made. Beeks suggested we focused on three “wow” factors to ensure we had luxury without being unsympathetic to the surrounds. 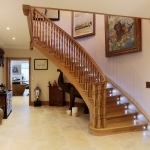 Our first luxury was the hand made, sweeping oak staircase. It is a statement piece. It greets visitors and it invites them to the upper floors. It is elegantly finished and Beeks did not let us down with the choice of the manufacturer or the installation. The workmanship was akin to if they had built the staircase themselves. Our second indulgence was the master suite, comprising of the bedroom, with eight-foot high Chinese Wedding Bed in situ, parallel dressing rooms and a luxury, high-spec bathroom. It was this huge, wooden structure, almost a room in itself that led to the ground floor being lowered. No standard ceiling height would have the capacity to accommodate, nor feature it in its full glory. I question whether any other building contractor, without the relationship that Beeks took the time to build with me, would have had the foresight to not only realise the ceiling height was to cause an issue, but to have the vision of how to solve this. The final indulgence was the orangery. We knew we wanted this to be very much the hub of the living area and it has been. Beeks ensured that not only was the orangery fully integrated into the living area, but also with vistas of the gardens, the wild flower meadow created by Beeks and the fields beyond. 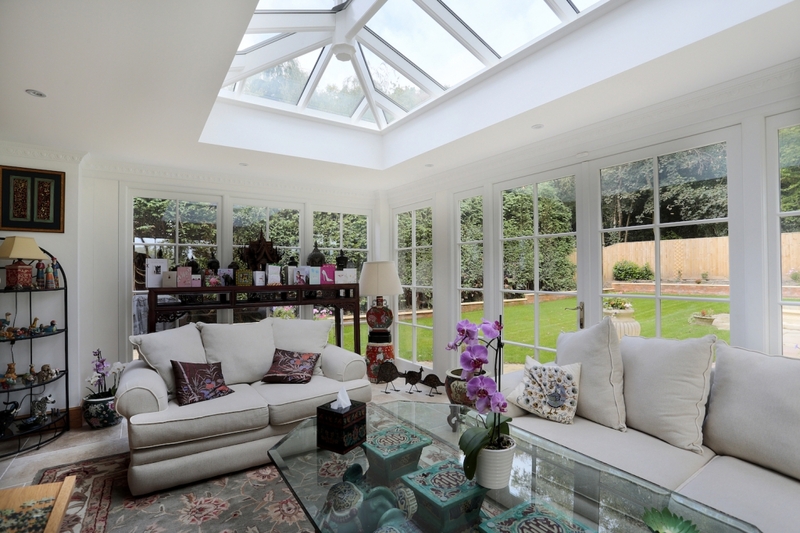 Like the rest of the build, the orangery was finished to the very highest specifications. With quality and sustainability front of mind, Beeks also advised on the best windows and doors for the entire property, both designs and materials. When The Manor House was accessed for its Energy Performance Certificates (EPCs), it was reported to be A/B and no recommendations were made to improve the environmental efficiency of the house. For a property of this size, this is a great testimony to Beeks’ understanding and application of the best products and techniques available. At all times I was amazed by the efficiency and management of the site. At no point did it ever look like a building site. The process management and focus on maintaining an efficient and safe workplace are reflected, I believe, in the quality of the workmanship. The site was always immaculate, it never looked anything like a building site. The cleanliness, processing and safety were second to none and this only filled us with greater confidence that the best finish would be achieved. Each member of the Beeks team demonstrated confidence in their work and an attention to detail that would be hard to rival. Such was the pride in their work that several requested my permission to bring their families to see their finished work. I was delighted for them to do so. It was a pleasure to know that the result of their pride and commitment was and is our dream home. 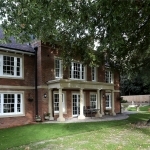 Brian Kane has commissioned Beeks Construction to build two luxury properties for him in Buckinghamshire. 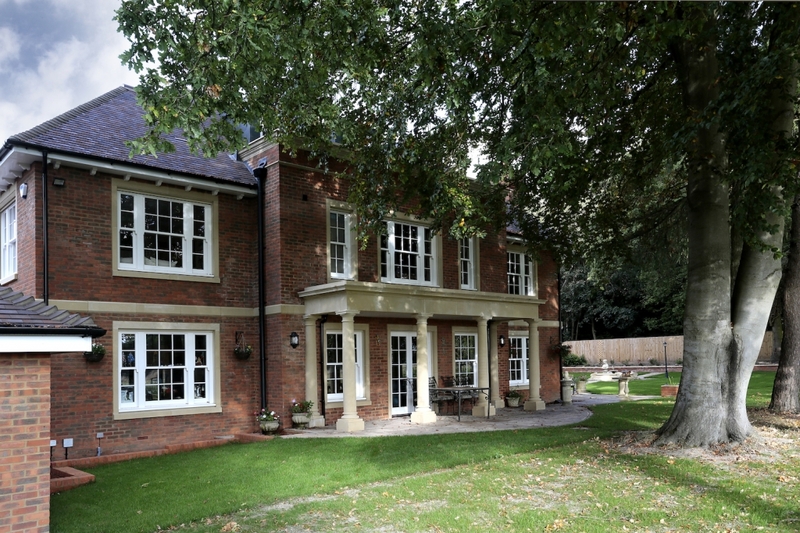 The project management of the first build, completed in Beaconsfield in 1995, was overseen by an architect. 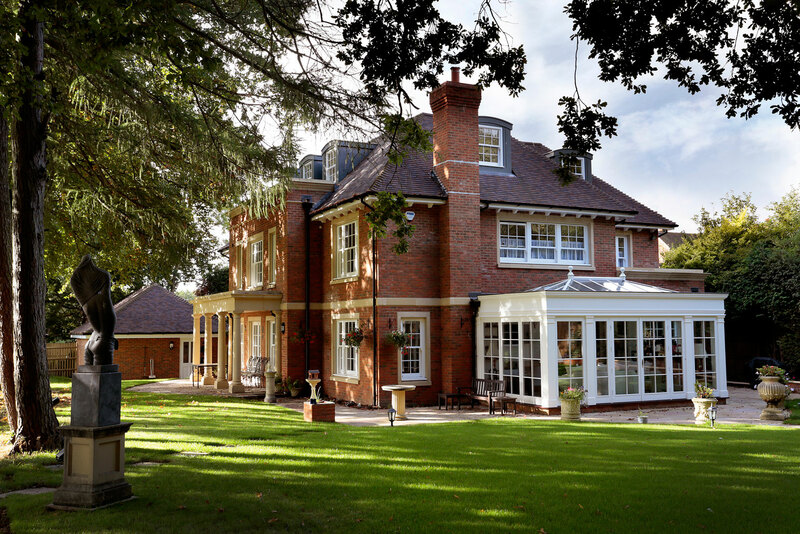 With more time on his hands following semi-retirement, Brian chose to manage the project management of The Manor House in Seer Green, which was completed in 2013.